In Japan, Dragon Quest is the unquestioned king of RPGs: Even the Final Fantasy series comes in a distant second. The last game in the series, Dragon Quest IX, sold over 4.3 million copies, making it the 6th best selling game on the Nintendo DS in Japan. Many speculated the next DQ game would surely be on the 3DS or the—then only theoretical—Wii U. 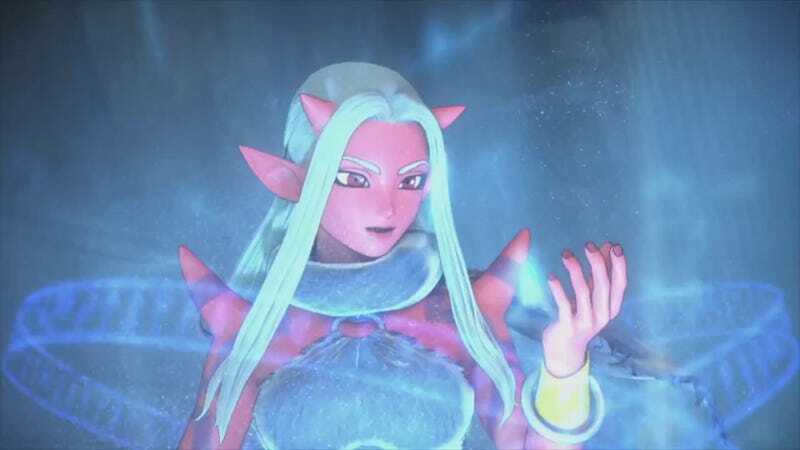 Instead Dragon Quest X was announced for the Nintendo Wii—a now six-year-old console on its last legs. But even more surprising than that was the revelation that the game would be an MMORPG, making it the Wii's first and only MMORPG. Taking the jump from single player to MMO is always a risky proposition. Some, like Ultima Online, gave new life to their franchises. Others, like Final Fantasy XI, were so polarizing they split the fanbases. Yet, Dragon Quest X is unlike either of these as it creates an experience that manages to be true to the Dragon Quest lineage yet, at the same time, incredibly backwards in terms of modern MMORPGs. Unlike in the Western world, MMOs have never really taken off in Japan—despite moderate hits like Phantasy Star Online and Final Fantasy XI. Therefore, it's no real surprise that Dragon Quest X is largely designed for Japanese gamers who have never before played an MMO. The game itself plays like many single-player JRPGs: you go around, talk to NPCs, do quests, and fight monsters. For battle, the game uses a form of the Active Time Battle System—one very similar to the version found in Final Fantasy XII. It even starts off in a single-player mode, where you can get used to the battle system and controls without having to worry about other players. Then, after a few hours you are dropped into the online game where your first quests teach you all about the social aspects of gaming. While all this does little beyond teach the basic play elements, it does insure that newbies will be able to play and enjoy the game, no matter their MMO experience level. Dragon Quest X claims to be enjoyable for those who want to play alone—going so far as to dedicate two servers to single players. But while it can technically be played without grouping, actually doing so is far from practical—at least in the beginning. To solo the first boss in the game, you need to be almost double the level that a team of players would need to be. Moreover, when playing alone, I literally could not make enough money from killing monsters to pay my inn bill (unless I ran ten minutes back to the starting town). However, when I joined a group, not only were we able to adventure pretty much indefinitely (by pooling item drops for healing) but we were also making four times the experience per kill since we could go to much higher level areas. Around level 15, your options for soloing take a sudden, positive turn. It is at this point (about 10-15 hours in) you gain access to one of the capital cities and have the income needed to unlock taverns. Taverns allow you to recruit other players' characters into your party as NPCs while they're offline. For a moderate fee, you can rent a group of characters for a maximum of 48 hours. The downside to this is that these characters will not level up along with you, and your control over their AI is rather limited. Still, they make soloing a viable option. That said, being in a party of other players is still the most efficient way to play. And while there is no general chat channel in Dragon Quest X, joining a party is remarkably easy as people congregate at the entrances to towns, boss areas, and dungeons if they are looking to join a group. There are also tags you can place next to your name indicating, among other things, whether you'd like to play alone or in a group (so you can find a party even if you're already in the field). Of course, the icing on the cake is that players are exceptionally friendly and polite, making it easy to find a group no matter where you are or what you're doing. But while the users may be friendly, the game itself is hardly user friendly. Though the basic controls of moving around and fighting are simple enough, "complex" actions—like leaving a group, allocating skill points, or quitting the game—are buried deep within the game's numerous text menus. But by far the worst thing in the game is the chat system for anyone without a USB keyboard attached to their Wii. It's as slow as it's mind bogglingly counterintuitive. Bad — Are You Ready to Grind? ridiculous amounts of grinding. And I don't mean what passes for grinding in modern MMORPGs—i.e. go to a town, load up on quests, and then get experience for killing monsters and completing the quests. No, I mean old school grinding where you just kill monsters for hour upon hour for no rhyme or reason other than wanting exp. Between levels 7 and 15 there was only a single quest; it took less than five minutes to complete and gave no experience points. Say what you will about slaughtering countless wolves for their pelts or what have you, at least it gives you the illusion of something constructive to do. Dragon Quest X was surprisingly backwards in its execution despite its sometimes inspired ideas and low entry bar. I found the story and battle system enjoyable. But once the game devolved into mindless grinding, most of the fun disappeared and the game became repetitive grunt work. However, if you are a Dragon Quest fan, love playing with others, don't mind grinding, or have been dying for another game that plays like FFXII, Dragon Quest X may still be worth your while. Dragon Quest X was released on August 2, 2012, for the Nintendo Wii in Japan. There is currently no word on an international release.